$1.77 trillion was lost to counterfeitand pirated goods globally in 2015, according to an estimate issued byInternational Chamber of Commerce (ICC). Besides revenue lost, brands maysuffer from negative impacts such as brand image damage and loss of customerconfidence due to lower customer satisfaction and consumer health hazards frominferior counterfeit and pirated products. With advancement in technology, wecan now give a unique identity to every product and have great visibility ofthe product’s journey in the channels. 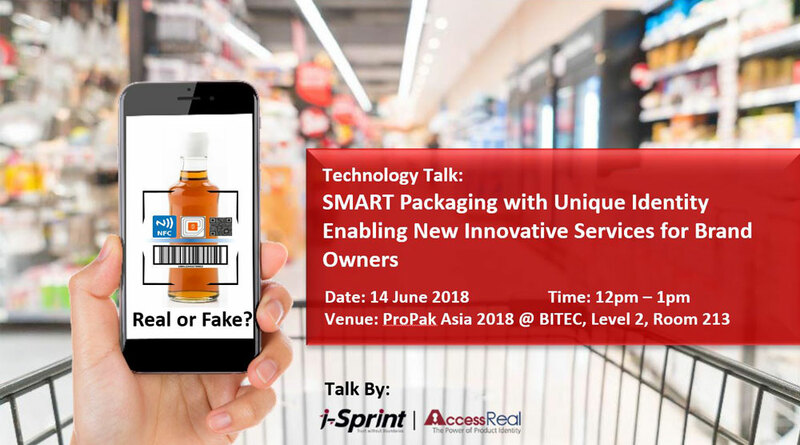 Attend this technology talk by i-Sprint Innovations to understand how you can tap on product identity technology to provide new innovative services for brand owners. How does the Digital Platform of Product Identity accelerating these mega market trends? Some of the companies who have used product identity technology include Moufans Commune, Procter & Gamble Hong Kong, Marshall Cavendish, Cuisinart, Singapore Manufacturing Federation, Augustinus Bader and more. To attend, please fill up the registration form below and submit.